The poem above was inspired by a little nineteenth-century volume of collected Weather Folklore, in which the author, introducing a section on lore of the moon, referred to our luminous orb as a “weather witch.” “The moon too has always had her votaries, as a weather-witch,” he writes, “and even now is not without a numerous staff of prophets ready to assert her influence over the rain and clouds.”** I have long been mesmerised by the magic in folklore; the spell-casting quality of proverbs soaked in centuries of wisdom and tales. The way these poems – for folklore is poetry – are woven from the dust of the earth by minds grown in its soil. Folklore is living memory, lived experience, and it blends together the fine filaments of magic and science. The weather-witch moon whispers her wisdom to votaries and prophets, but what she foretells, though shrouded in mysticism, has more basis in science than we might at first think. According to Weather Lore, “The further the ‘burr’ or halo appears from the moon, the nearer at hand is the coming rain.” The idea that a haloed moon foretells rain is actually reflected in modern atmospheric sciences, where the light reflected from the moon is refracted by ice crystals at high altitude, such as when passing through high sirrus clouds, which can be the earliest to appear in an approaching low front. The idea that weather changes are more likely to occur around the full and new moons is increasingly supported by science, with some studies recording rain following the full and new moons. There are other ways that folklore and science meet around the full moon. Folklore has long associated the moon’s cycle with the wax and wane of women’s menstrual cycles (on average, both last 28 days), fertility and pregnancy, and it seems that some scientific investigations have noticed a similar correlation. It is said that more births are recorded after full moon’s peak than at its wane, as if the swollen lunar belly tugs at the womb, drawing its life outwards like the ocean’s tide; while the onset of menstrual bleeding more commonly falls after the moon’s peak. The influence of the moon on psychology and human behaviour was prevalent long before modern investigations began to notice the seeming accuracy of the correlation. The words “lunacy” and “lunatic” derive from “lunar” and the 1842 Lunacy Act defined a “Lunatic” as “a demented person enjoying lucid intervals during the first two phases of the Moon and afflicted with a period of fatuity in the period following after the full Moon.” The moon’s tug seems to throw out the balance of things; the earth is akilter; the minds and bodies of its creatures driven wild in the ebb and flow of their tidal energies. Strangely enough, some studies have noted that incidents of violence and murder peak at the full moon. “Two full moons in a month bring on a flood.” – from Bedfordshire. “If the moon change on a Sunday, there will be a flood before the month is out.” – from Worcestershire. 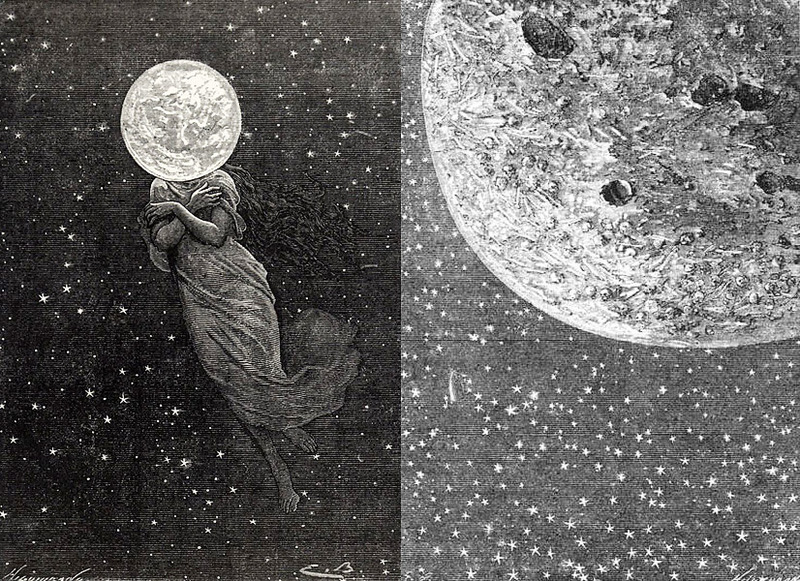 Whether completely grounded in science or leaning more to the superstitious, one thing is clear: moon lore and related forms of folklore are poetic remnants of the past that are well worth cherishing. May we continue to pass them down. Do you have any moon or weather-related folklore? Share in the comments below! ** Folklore taken from: Inwards, R. (ed. ), Weather Lore: A Collection of Proverbs, Sayings and Rules Concerning the Weather. London: W. Tweedie, 1869.